Yeah. Doing card tricks for the blind didn't really accomplish much. Oh, and it's "sleight" of hand. 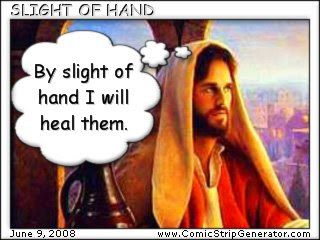 Maybe he slightly used his hand, like Obi Wan in Star Wars slightly waved his hand when using 'the Force'. No? Into the Woods . . .